BACK ON THE MARKET- Buyer financing fell through. Rarely available first floor end unit w/attached garage. Beautiful condo in gated Palmer Oaks. 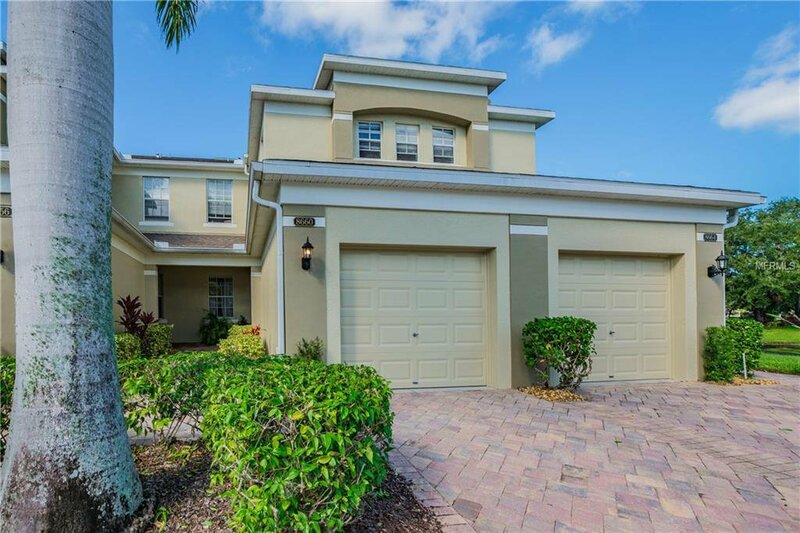 Meticulously maintained with an open, spacious eat-in kitchen w/ rich cherry wood cabinetry w/ pull outs, upgraded stainless steel appliances, granite countertops, & large walk in pantry. The island has plenty of work space & seating for 4. Dining room is steps away overlooking a large pond with fountain. Glass French doors lead to the den/study with beautiful hardwood floors, custom outfitted with top of the line built-in cabinetry & desks. Perfect for working at home or a quiet study. Large master bedroom, en-suite bath has upgraded tile & granite, soaking tub, shower, dual vanities & large walk in closet. Lovely guest area with private bath. The lanai has a tile floor, plenty of room for outdoor furniture and is a peaceful area to relax. The owners have updated almost everything in the home including HVAC installed 2015, water conditioner, new tile in the kitchen,foyer & refinished wood floors. Interior recently painted along with new lighting fixtures & fans. Plantation shutters and blinds. Attached garage has overhead storage, cabinets & new epoxy floor. Includes the Nest smart thermostat & the Ring doorbell with a camera & notifies you of anyone at the front door. Both controlled by smart phone. Perfect for seasonal residents yet large enough for year round living. Heated community pool. Located minutes to Siesta Beach, Downtown SRQ, restaurants & I-75.